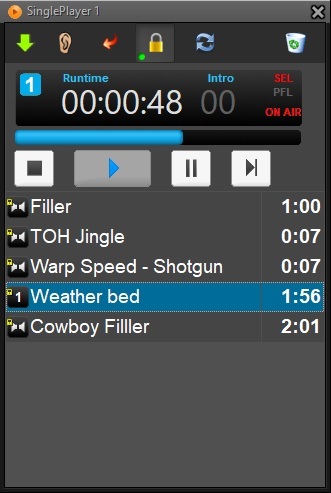 The SinglePlayer application can be used for full automation of the broadcast. Additional modules can be added to get material not only over the airwaves, but also on the web, satellite or DAB+. The SinglePlayer channel window displays various functions and icons that let you control airing and viewing the status of a playlist. You have two possible ways to automate the broadcast: activating the Chain-all function or relying on clock settings. But you can also manually control the broadcast. Up to sixteen channel windows can be displayed on a single workstation screen. To make your playlist, simply drag and drop titles from the Database explorer or refer to pre-scheduled programs.